The Rebel Sweetheart. : The Ultimate Fighter 17 | Awesome Coaches, Great Contenders, Superb Fights, Best Season Yet. 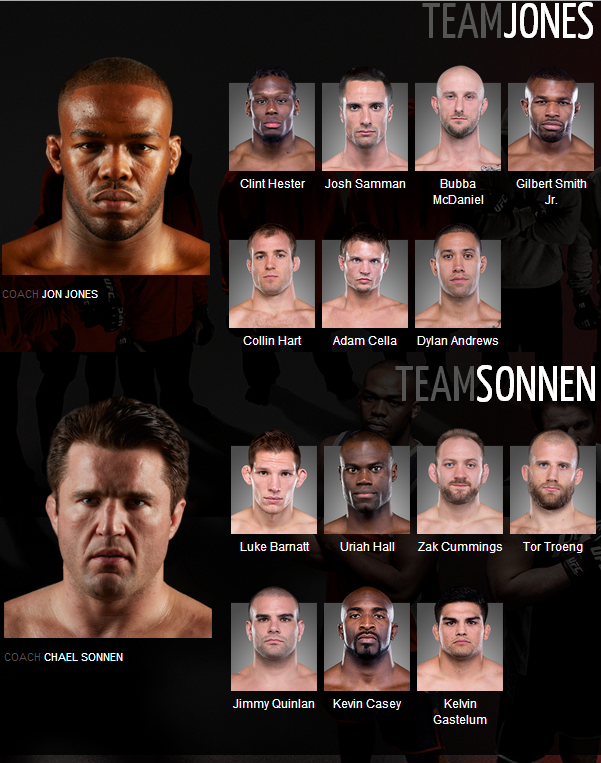 The Ultimate Fighter 17 | Awesome Coaches, Great Contenders, Superb Fights, Best Season Yet. I give myself a pat on the back for watching this season of The Ultimate Fighter from start to finish. Well, the show isn't finished quite yet. There's still the Finale, which happens tomorrow (April 13) in Las Vegas. But I must say, this is the only season that I've watched religiously - not missing any episode, watching even the reruns - heck, I even keep tabs on all the contenders via their social media accounts! The match between the two coaches is something fans have long been looking forward to. We all know how Chael Sonnen called out Jon Jones last year when he posted this on his Twitter account: "30 min to cement your legacy. Champ or Coward?" Chael wanted to replace Henderson in the main event for UFC 151; that didn't happen because Jon refused to fight Chael unprepared and the event had to be cancelled altogether. UFC 151 will go down in history as the event that never happened, and Chael taunted Jon Jones later on by saying, "I KNOW you will never fight me. Don't be afraid. But I'll always be the monster in the closet of your mind, little JJ." That bad blood alone makes this season a must-watch for TUF fans. 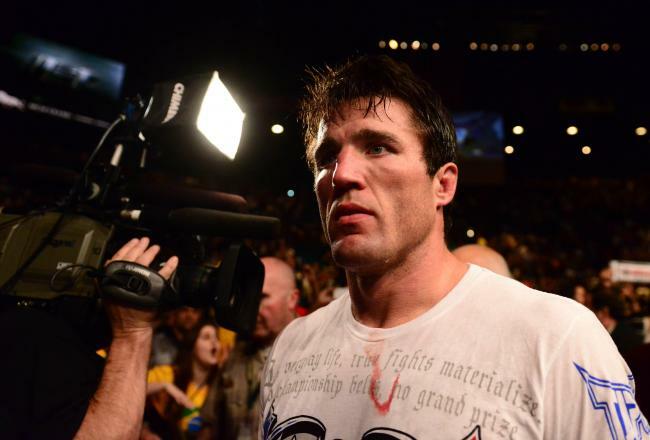 But what made this more interesting for me was how I saw a different side of Chael as he mentored Team Darkside. Sure, he's outspoken, has an air of arrogance, and often speaks brazenly, but his coaching skills are quite commendable. The way he trained his team, the way he bonded with them, the way he encouraged and kept on motivating them to achieve their dreams of making it to the UFC - truly praise-worthy. For the first time ever, I saw a new Chael Sonnen. One that has a big heart, cares for other people, and looks after his team as if they were his family. I must say, the show 'humanized' the Bad Boy, and I have a new-found love and respect for the man. And then we come to the Contenders - an interesting mix of strikers, boxers, wrestlers, grapplers. This bunch is oozing with skills, talent, and personality, which makes this season of The Ultimate Fighter the best ever. Even Dana White can't argue with that fact. The fights from this season have left many in awe, and the UFC President was one of them. TUF 17 - Best Season Ever! In the Main Card, there will be Bubba McDaniels against Gilbert Smith, while Uriah Hall will battle against Kelvin Gastelum for Finale itself. Now I'm not too happy with Bubba being in the Main Card - against Gilbert Smith, of all the people?! If this is Joe Silva's retort to Dana White forcing him to 'make the matches work mathematically', well, okay, haha. I get it, you're trying to be funny. Rumor has it that the only reason for Bubba to be included in the Main Card is because of Jon Jones - they're friends, they train together, Dana looks favorably upon him - get my point? In my opinion, the Jimmy Quinlan vs Dylan Andrews bout should be in the Main Card because yeah, I love Jimmy - he's a great grappler and a World/Pan Jiu Jitsu Champion too boot (also he's my favorite in the bunch, which I've said time and again on my Twitter account) while Dylan has great mixed martial arts skills and one hell of an exciting fighter. As for the finalists, we've got the half-cyborg, half-Namec fighting machine named Uriah Hall, and the dark horse of the season slash youngest TUF contender ever Kelvin Gastelum. It's hard for me to make a fearless forecast as to who would win this match. Sure, Uriah is known for mutilating his opponents in mere seconds (still can't forget Carlos Condit's face when he saw Uriah KO'd Bubba), but Kelvin has finished all his matches, has the skillset to takedown and hold his opponent, and has knockout power that shouldn't be overlooked. I know Dana White would have preferred a Uriah Hall-Josh Samman finals, but the stars didn't quite align for the cocky Florida native. (To quote fellow contender Adam Cella, "Nobody loves Josh more than... Josh!") Oh well, est quod est - it is what it is. 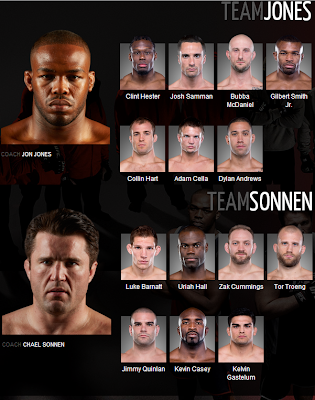 I am so looking forward to this season's finale, and I can't wait for Chael's match against Jon Jones. Chael promised me a victory, by the way. I promised to throw a party if he wins against Jonny, lol. 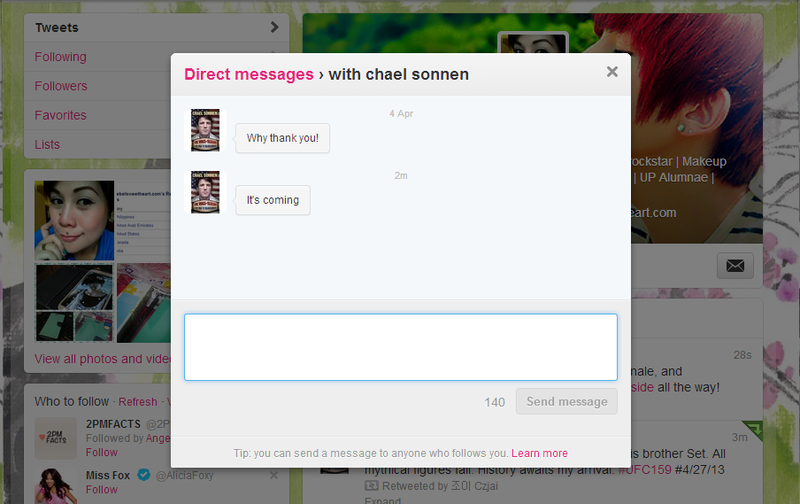 DM from The Chael Sonnen - priceless. Follow Team Darkside on Twitter! For those who are wondering, no, this is not a sponsored post. Wow! You're really in this! My brother and his wife gets crazy about this and I just couldn't. I will have to share your post.